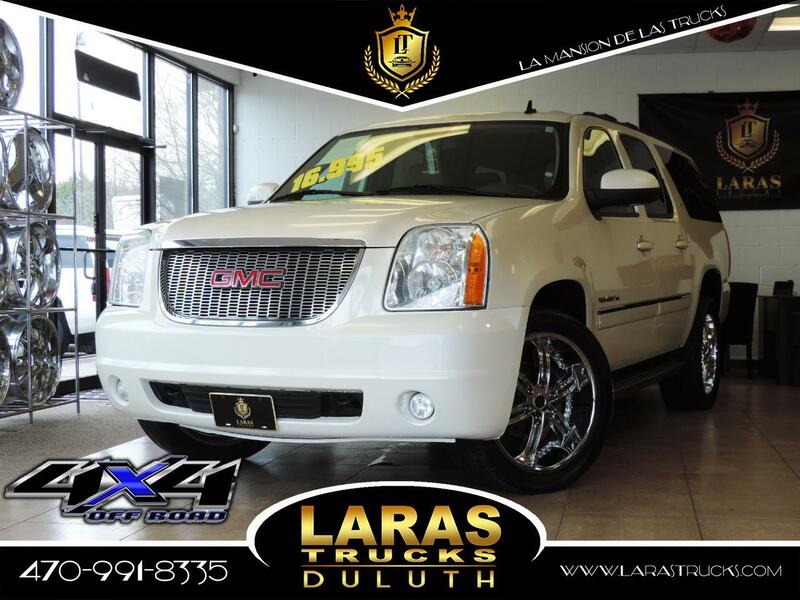 It's massive and its third-row seats don't fold flat, but the 2011 GMC Yukon XL is an excellent choice for large families who need a full-size SUV with maximum seating, towing and cargo capacities. That time-honored American notion that "bigger is better" has been shot full of holes over the past few years. Especially when it comes to the vehicles we drive. And yet we have to admit there's still a place in this world for full-size sport-utility vehicles like the 2011 GMC Yukon XL. While most folks would have a hard time justifying owning this shiny three-ton SUV, there are some situations where the Yukon XL -- and its Chevrolet Suburban sibling -- actually makes sense. If you need one vehicle that combines seating for nine passengers, cavernous cargo capacity and enough muscle to tow big trailers, the Yukon is pretty much your only choice. Given the Yukon XL's enormous dimensions and powerful V8 engines, its ability to handle all these schlepping tasks isn't all that surprising. What is rather unexpected is the big truck's level of refinement, including its relatively smooth ride and quiet interior. You can also get some rather luxurious accommodations offered in the top-of-the-line Denali model, which includes quite a few standard features that would seem right at home in a high-end sedan. Of course, there are downsides to driving an 18-foot-long SUV like the Yukon XL, not the least of which are maneuvering in tight quarters and abysmal fuel economy. The Yukon XL also loses points in the practicality column for the outdated design of the 50/50-split third-row seat, which has to be removed and stashed somewhere to take advantage of the interior's full cargo capacity. Other than the aforementioned 2011 Chevy Suburban and its uptown cousin, the 2011 Cadillac Escalade ESV, the Yukon XL has few peers. The 2011 Ford Expedition EL offers the distinct advantage of a fold-flat third-row, but seats only eight passengers and is a little down on power compared to the GMC's three different V8 offerings. The 2011 Toyota Sequoia has power to spare, but also seats only eight passengers and offers significantly less cargo room. While we're thankful that most people no longer consider driving a humongous SUV to be a status symbol, we're equally glad the 2011 GMC Yukon XL is still there for those few buyers who really need all the versatility it has to offer. The 2011 GMC Yukon XL full-size SUV is available in 1500 and heavy-duty 2500 models, which are available in three trim levels: SLE, SLT and Denali (1500 only). The base SLE trim comes well equipped with 17-inch alloy wheels, running boards, full power accessories, keyless entry, a 40/20/40-split front bench seat (with six-way power adjustments for the driver), dual-zone manual climate control, rear-seat air-conditioning, a trip computer, Bluetooth connectivity and an eight-speaker audio system with a USB port, CD player and satellite radio. The SLT adds power front bucket seats, leather upholstery, tri-zone automatic climate control, Bose audio with nine speakers, power-adjustable pedals, remote vehicle start, an auto-dimming rearview mirror (with a built-in rearview camera) and rear park assist. The top-shelf Denali gains unique styling touches that include lower body cladding and a unique grille, 20-inch alloy wheels, a power liftgate, heated and ventilated front seats, heated second-row seats with a power-folding feature, a larger display for the rearview camera, a navigation system and a 10-speaker Bose surround-sound audio system. Some of the standard features found on the upper trim levels can be added to the lower ones as optional equipment. Other options (depending on trim) include 20- and 22-inch wheels, a sunroof, a navigation system, a side blind-zone alert system, second-row captain's chairs and a rear-seat entertainment system. Options for the Denali include a variety of 20- and 22-inch wheel styles, power-retractable running boards, a sunroof and an additional third-row screen for the rear-seat entertainment system. The 2011 GMC Yukon receives only minor feature updates. Three V8s see duty in the Yukon XL. Most versions come standard with a 5.3-liter V8 that makes 320 horsepower and 335 pound-feet of torque. All 1500 engines are paired with a six-speed automatic transmission. Yukon 2500 models come standard with a 6.0-liter V8 rated at 352 hp and 382 lb-ft of torque. This larger V8 is also mated to a six-speed automatic, though this one's geared for enhanced towing capability. Fuel-mileage ratings range from 14 mpg city/20 mpg highway and 16 mpg combined for the Yukon XL with the 5.3-liter V8/2WD powertrain down to 12/19/14 for the Denali. Properly equipped, a Yukon XL 2500 can tow up to 9,600 pounds. Stability control is standard, as are antilock disc brakes, side curtain airbags, front side airbags and an updated version of OnStar. A blind-spot alert system is optional on the upper trims. The 2011 GMC Yukon hasn't been tested using the government's new, more rigorous procedures. But in prior testing, it earned a top five-star rating for its protection of occupants in frontal and side-impact collisions. With its big V8, the 2011 GMC Yukon XL models feel fairly quick for such a big vehicle. That's especially true for the top-of-the-line Denali with the 403-hp 6.2-liter engine under its hood. The tradeoff, of course, is poor fuel economy that just barely breaks into the double digits. The Yukon XL's suspension also offers a comfortable ride quality that, combined with the relatively quiet interior, makes the Yukon XL a fine roadtrip machine. Unless, of course, you'll be driving a lot of twisting mountain roads, as handling suffers from its massive curb weight. Arguably the strongest selling point for the 2011 GMC Yukon XL is an interior that offers seating for up to nine passengers, a number bested only by full-size vans. Seating arrangements include a choice of a 40/20/40-split bench or buckets up front, with a 60/40-split bench or a pair of captain's chairs in the second-row. The three-person third-row seat is standard. The Yukon XL's cavernous cabin also offers plenty of cargo room, with nearly 49 cubic feet of room behind the third-row and a whopping 137.4 cubic feet with the third-row seats removed and the second-row seats folded. Unfortunately you'll need to yank out and store both halves of that third-row seat in order to make use of all that space, a process that requires no small amount of muscle. On the upside, the design, materials and fit-and-finish of the Yukon XL's interior are all noticeably nicer than those found in previous generations. Gauges and controls are laid out in a straightforward and intuitive manner that makes them simple to use.